England’s ‘waste from households’ recycling rate has increased to 45.1 per cent for 2016/17, rising once more after dropping last year, according to the latest figures, which also reveal significant increases in energy-from-waste (EfW) treatment and separate food waste collections by local authorities. Released today (5 December) by the Department for Environment, Food and Rural Affairs (Defra), the latest ‘Statistics on waste managed by local authorities in England in 2016/17’ reveal the state of the collection and management of waste in local authorities across England. The increase in recycling tonnages and the overall rate can partly be attributed to the inclusion of metal recovered and recycled after incineration (IBA metal) in official recycling figures, whereas previously IBA metal would have been reported as ‘recovery’ of waste. The statistics go on to show that the total volume of waste collected directly from households increased by 1.1 per cent to 22.7 million tonnes between 2015/16 and 2016/17, while total waste recycled increased from 10 million tonnes to 10.3 millions - an increase of 2.6 per cent. The volume of dry recycling collected, meanwhile, increased by 1.6 per cent to six million tonnes in 2016/17. In terms of the management of all waste collected by local authorities, 2016/17 saw another fall in waste going to landfill, dropping from 5.1 million tonnes in 2015/16 to 4.1 million tonnes - a decrease of 19.4 per cent. However, only 4.1 per cent of that reduction ended up being recycled or composted, a total of 11.3 million tonnes of waste, with most of the reduction being offset by a 9.9 per cent increase in the incineration of waste, with 10.1 million tonnes of waste going to incineration (9.9 million of which went through EfW facilities) in 2016/17, up from 9.2 million in 2015/16. The total amount of waste going to incineration has almost doubled in the past five years, with only 5.5 million tonnes of waste going to incineration in 2012/13. This means that EfW now makes up 38.6 per cent of local authority waste (not the same as household waste), compared to 42.8 per cent going to recycling, a rise particularly noteworthy given the current debate over the need for future EfW infrastructure. While separate data on food waste from households is only available for January-December 2016, the statistics show a 15 per cent increase in separately collected food waste sent for composting and anaerobic digestion over that period, up to 353,000 tonnes from 307,000 tonnes in 2016. However, that increase only equates to an increase of 0.2 per cent to 1.6 per cent of the total waste composition of ‘waste from households’, while ‘other organics’ (17 per cent) and ‘dry recycling’ (27 per cent) also remain largely unchanged. 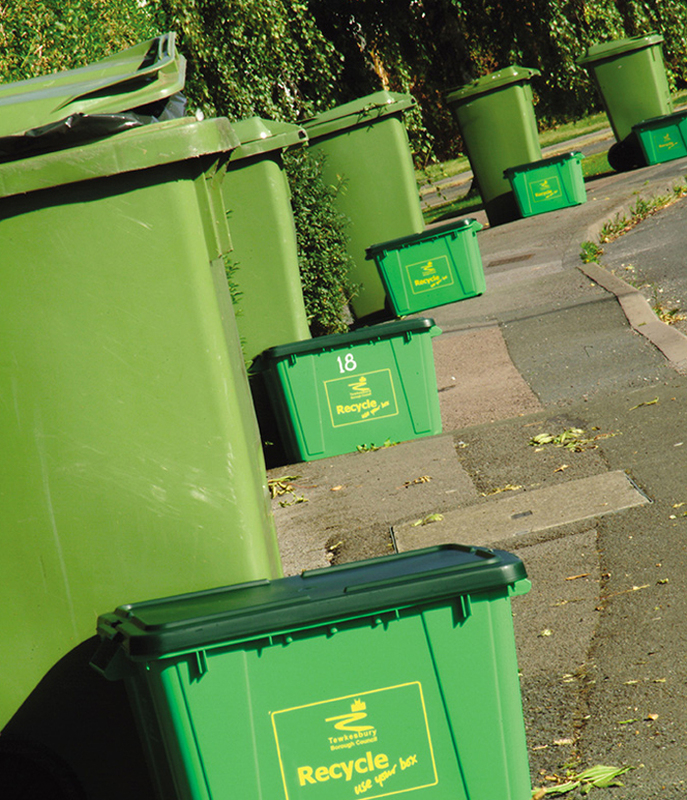 Defra’s statistics also include data on ‘household waste’, which is a broader definition of waste that includes street bins, street sweepings, gully emptying, parks and grounds waste, soil and compost like output, separately collected healthcare waste and asbestos. 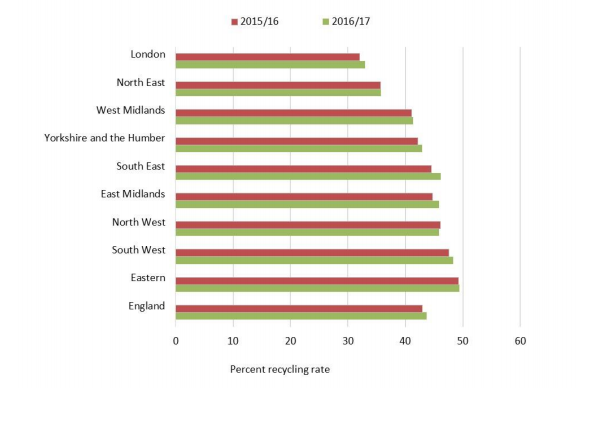 There is significant regional variation in ‘household waste’ recycling rates, with London registering a rate of 33 per cent in 2016/17, while the East of England managed a 49.4 per cent rate. The South East experienced the largest increase in ‘household waste’ recycling, up by 1.7 per cent to 46.2 per cent in 2016/17, with the East Midlands and London also seeing increases of one per cent. The North West was the only region to experience a slight decrease, seeing its rate fall by 0.2 per cent to 46 per cent. You can find more information on Defra’s statistics for England on Defra’s website. The argument over the future of the UK’s residual waste treatment capacity has reopened today, after the ESA published a review of previous reports and reiterated the prediction that six million tonnes of residual waste will have nowhere to go in the UK by 2030. The UK is heading for a residual waste treatment capacity gap by 2030 unless significant new investment in infrastructure and policy frameworks are put in place, according to SUEZ’s new report. The UK government has targeted zero avoidable waste going to landfill by 2050 and confirmed plans for a Waste and Resources Strategy in its long-awaited Clean Growth Strategy yesterday, detailing its plans for a low-carbon future for the UK.